Could this be the e-currency's Renaissance? Yesterday, Bitcoin was back above $1,000 for the first time since January 5. The cryptocurrency was higher by 1.5% at $1,000.10 a coin as of 11:39 a.m. ET. And by today, has risen even more to nearly $1,025.07. It’s been a wild year for bitcoin. It began 2017 with a 20% rally during the first five days of the year before crashing 35% on concerns of a crackdown on trading in China. Thursday’s gains have extended bitcoin’s winning streak to a sixth straight session as trade appears to be benefitting from uncertainty surrounding Donald Trump’s presidency. 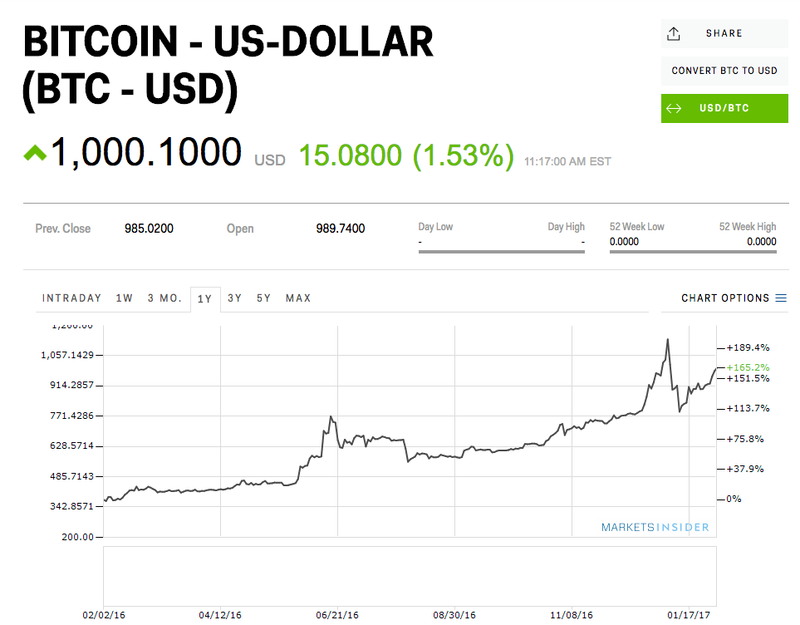 The cryptocurrency has gained nearly 10% since Trump was inaugurated on January 20.